A solid wood bookcase provides a stylish and practical piece of furniture for your home. The Amish 72" Wide Executive Bookcase is a custom made bookcase that can satisfy a number of needs, all the while looking beautiful in its solid wood form. This customizable office furniture is available in a 48", 60", 72", or 84" height. Adjustable shelves allow you to create the display and storage area that accommodates your items perfectly. Tongue and groove shelving is strong to support your items while the entire bookcase is topped with lovely crown molding. Line the shelves with all the materials your office needs, or store your collection of treasured novels on the spacious and sturdy shelves. 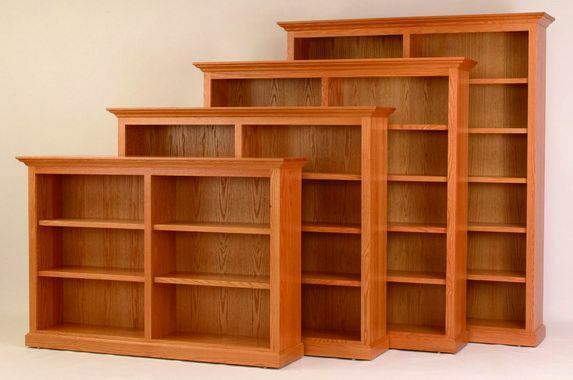 Browse our collection of Amish Made Bookcases in all the styles you can imagine from mission to modern. Made from solid hardwood to provide decades of use, this solid wood bookcase is handcrafted in Ohio in an Amish wood shop. Height: 48", 60", 72", 84"
This is absolutely beautiful! Please forward this photo to the maker. It arrived yesterday with Eli and his son. They were so careful and professional. I'm so pleased to have found Dutchcrafters! We have the bookcase as a focal point in our family room. It is stunning and receives complements daily. I just want to start by saying I am probably one of the pickiest people when it comes to my furniture. I notice every scratch and ding and I can honestly say our furniture came completely flawless. I can't believe how beautiful it is. The pictures I have taken don't do it justice. In the pictures the color is off and looks a little blotchy but in person the pieces are absolutely stunning. I ordered a few other pieces at the same time from a high end retailer and they can't even compete with the quality and look of these. Thanks again for helping me customize my furniture. I will definitely be back next time I need furniture.